The fact that Canadian Foresters were logging in our area in World War 1 is a fairly well known local fact, but there is little to see today of their efforts. The camp was dismantled after the war, leaving no permanent reminders, and the local paper, “The Woburn Reporter”, has not survived from that period, so there is little to do research from. Then a postcard appeared, showing a large group of men, identified on the reverse as “Officers, NCO’s and some of the men of 125 Coy, C F Corps, Woburn Sand [sic] 19/06/18”, and during correspondence with a Canadian museum at Chilliwack, British Columbia, (whom had been contacted about the Canadian connections in the 1920 Social Club Recipe Book) a link was found to the Official War Diary for the 125th Company, Canadian Forestry Corp., who were part of District 53. This is a transcription of that diary. Most of the entries were completed by Major Allen R. Wilson, the Commanding Officer. It shows that the Canadians were at Woburn Sands for just 16 months. N.B. – “F.B.M.” is a cubic measure for timber and means “Foot. Board. Measure”. One “f.b.m” is equal to one foot length of 12 inch by 1 inch timber. Any additions I have made to the text are in bold italics. This Company is located in the County of Bedfordshire Buckinghamshire noted for its agricultural pursuits and its beautiful woods and estates, which are owned by the Duke of Bedford. It is the Timber of the latter that it is proposed to deal with, and approximately nineteen million feet F.B.M are estimated as being available. Theses areas border the village of Woburn Sands and so the Camp site was chosen on the outskirts, just three quarters of a mile from the station. A light railway was to be built to connect the Bush operation with the Canadian Mill, this Mill site being half a mile from the L. & N.W. Ry. Station of Woburn Sands. Accordingly on the 18th August 1917 the advance party of four Officers and thirty two O. R. [Other Ranks] under Command of Capt. A. R. Wilson arrived from the Base Depot and were billeted in the village. A large field, the property of the Rev. Percy Allnutt, was selected as a site for the permanent camp on August 20th situated conveniently near to the Bletchley-Bedford road. A few days later Mr. Allnutt announced the free use of this land by the 125th Company, and also the use of his residence [Edgbury, Aspley Heath] for Officer’s quarters. 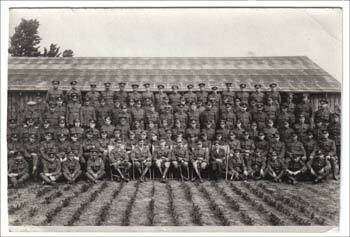 Subsequently on the last day of the month, the Officers moved in, the men put under canvas pending the building of permanent Hutments, and the private stables of Mr. Allnut taken over for the motor lorries. Also on this day the construction of the light railway from Aspley Heath to the Canadian Mill site was begun. Felling commenced in Aspley Heath woods (owned by the Duke of Bedford) on the 21st Aug. and preliminary plans for the shipment of lumber through Woburn Sands Station arranged. On the 29th the Mud sills for the Canadian Mill were set, and cement work for the engine bed and Dutch ovens were started. The advance party of four Officers and thirty-two O. R. was increased by the end of the month to a total of four Officers and one hundred and twelve O. R.
As it was decided to operate a second mill, a Scotch Mill was set up on the Aspley Heath Road and commenced cutting on the 30th August to convert lumber for the erection of 125th Company Canadian Mill and Camp end also 126th Company, Ampthill, Mill and Camp. During the month of September the strength was increased one Officer and 80 O.R. and 42 horses, In October one Officer was struck off and eleven O.R. added, so that on the 1st day of November the strength was 6 Officers and 181 O.R. and 105 P/W [Prisoners of War] (Germans), During December 20 O.R. and a three ton lorry were added and two horses struck off. Work on the Canadian Mil was carried on all through September and October and on November 14th the mill turned out 986 feet as the first day’s production. By November 19th this was increased to 15607 feet and lumber shipped amounted to 8559 feet. Compared with the records of the next two months (i.e. January and February) these figures are small, but show that the Mill production is steadily improving. On October 16th Major Anderson and Capt. Beckett called. On Nov. 29th the Camp received a visit from the District Sanitary Inspector from the Eastern Command, and who reported most favorably on the Camp. On Dec. 21st Capt. Begg, the District Medical Officer, came to inquire into the general health of the Camp. Christmas being a holiday, the men received a fine goose dinner which proved most satisfactory to all ranks. In the evening a dance was held and was well attended. These huts were completed and ready for occupation on Nov. 1st 1917. In addition to the above is a Y.M. C. A. hut 26′ x 72’ is sheeted on the outside with slabs; Mr. Allnutt paid for the material used and erection of the building, as a contribution to the Company. Also there are the stables, lined on the outside with slabbing and on the inside with rough unedged boards. These stables will accomodate 16 teams (bush stables) and 7 teams (Mill stables) respectively. Transport facilities with this Company consist of five three ton lorries and one team, the lorries drawing pitwood and logs to the Mill, the team being employed around the Camp. The light railway takes care of the bulk of the timber coming into the Mill. Rations are drawn by a light Ford Van from Bedford, 14 miles away. Roads in this vicinity are all excellent, being metalled, but some side roads running into the operation are poor and are now receiving attention. Little or no time is lost on this account however. On Sept. 21st this Mill cut 11,797 feet F. B. M. and on Oct. 10th established its record of 12,703 F. B. M. On Nov 3rd this Mill was moved to the far side of the cut on the Longslade Road, and began cutting again on the 7th. On the 1st of January there were 7 Officers and 202 O.R. on Parade, but on the 23rd one Officer, Lieut. J.W. Muncaster was struck off. On Feb.1st, Lieut. G. E. Oxley left for the 12th Canadian Reserves and his place taken by Lieut. C. H. Chandler. On Feb.14th Lieut. R. N. Gilmour was struck off also. On Feb.28th strength had decreased to four Officers and 181 O.R. The above figures are given to illustrate the steady rise in production of the Canadian Mill. Jan.14th -17th: Heavy snow fall delays lorries and light railway, and the German P/W refused to work because of it. A hostile Air Raid on the 28th was the cause of our night shift stopping work for three hours, but resumed again after this Aerial visitation. Feb. 12th: Not one car was available for shipping purposes. This Company is capable of shipping thirty cars daily and the Admiralty order so urgent too. On a later day, only three cars could be secured. February 11th Capt. Benson came for pay day. 12th Col. Savage and Capt. Begg. 15th Col. Thompson D.D.T.O. France. 16th Col. G. V. Whlte and Major Andersen. During February a small dance has been held every Tuesday night in the Allnutt Hut (erected and maintained by Mr. Percy Allnutt for the benefit of the men of the Company) and every Friday night a concert party came and entertained the men and their lady friends of Woburn Sands. On January 1st this Mill out 7283 feet F. B. M.
do 7th do 9111 feet F. B. M.
do 24th do 10265 feet F. B. M.
On February 24th do 7328 feet F. B. M.
During the first week of February the Scotch Mill was moved from its location on the Longslade Road to a new position near the village on the Woburn Road. On February fourth a call was made by Corps headquarters for a certain quantity of lumber this was distributed to the various districts and by them to the several companies under their command. Like the rest of the mills in the 53rd District, we were ordered to cut and ship all material possible of the dimensions given. This included not only what we cut saw in both Canadian and Scotch Mill but most of our stock in hand. Upon receipt of this order we immediately put all our energies into the fulfillment of same, not only in the mills, but in the woods and shipping departments. The men were paraded and informed by Major Wilson of the necessity of getting out this lumbar and seeing that it was placed on the track to be hauled away by the railroad people. It is gratifying to know that all the officers, N. C. O’s and men saw this opportunity of doing their “bit” and placed their shoulders to the wheel , with the result that we made a record cut. By way of supporting this latter statement, for the Canadian Mill alone, the average of eight days consecutive cutting was 38,248 F. B. M. per day. On March 23rd our cut was 42,955 F. B. M. which is a proof that all the men were quite keen to put out the maximum. We might say a word about the shipments as we had a record on that also, shipping on one day 122,232 ft and following it up the next day with a shipment of 115,197 ft. In all during the period this order was running, we shipped 1,952,746 F. B. M.
On the 27th we received twenty additional men who are to operate the resaw plant which is to be installed shortly at the Canadian mill. These men are at present in the woods, but were sent here as being capable around saws so that as soon as this plant is erected they will be taken from the woods and put on the resaw plant which is to cut the crating. Owing to continuous dry weather, we have had to stop burning brush for fear of starting a bush fire. In the Scotch fir belts the debris on the ground has become exceedingly dry. On February the thirteenth the Scotch Hill was moved to an area of mixed hard and soft wood close to the village of Woburn Sands, and has been cutting without interruption aver since. On March fifteenth 11,064 F.B.M. were cut. All the lumber except Oak was shipped to France on the French Order. We wish to point out that with the exception of the Sawyer, setter, saw-filer and engineer; this mill is operated entirely by German Prisoners of War. Further the hours are short for they only work from 8 a.m. to 4.45 p.m. This cuts down the possible output considerably, as two hours a day are lost in this way. There have been exceptionally few visitors this month. On the fifth Major Bagot called, and on the eleventh Sir John Maxwell and Colonel J. V. White. Lieut Col. Andersen and Lieut McCallum of District Headquarters made their regular call on the 16th. On the tenth additional timber was obtained and we commenced felling in the new area of Bow Brickhill Heath. This timber which is all pine, is of the finest quality of scotch fir, and assisted us in maintaining our average on the urgent France orders. In addition to Bow Brickhill Heath, Aspley Woods was recommended together with Charlie Woods four miles from the mill; and Back Woods, which will necessitate a small hoist for hauling the timber up a ten percent hill before it reaches the cars. A small strip of excellent mature pine Inside the Duke of Bedford’s wall was also recommended. These areas if obtained, will keep the mill operating approximately six months all told. On the nineteenth of April construction was started on the re-saw plant for making ¾ inch crating. The plant consists of a Ransome boiler, a re-saw and a single edger at present, and later to be increased by a double edger and Butting Saw. This plant will utilize many tons of slabbing that would go to waste as fuelwood, and therefore from a production point of view will greatly increase the output. During April the company received a number of visitors, chiefly on account of the necessity of looking up new timber areas. In this respect, the Officer Commanding 53 District came with Colonel Penhorwood and Colonel White on the fourth, again with Lt-Col. Campbell and Lt-Col. Robinson on the fourteenth, and again on the twenty-ninth with Lt-Col. Perrit and Captain Aiken. We are glad to be able to record a visit from Captain Shelley on the twentieth, who was for so long a time unfortunately compelled to give up his duties. The discipline of the camp for the past few weeks has been nothing short of exemplary, which it has been indeed, since its organisation. For the whole nine months there is not one instance of a Court Martial Case; there is only one Instance of Absence without leave exceeding twenty-four hours; for three consecutive weeks we have submitted a Nil Minor Offence Report. Considering the great number of nationalities represented in the company, and that the percentage of non-English speaking men is 32, we consider this record to be good. Amongst the visitors to this Company during the month were: – Major Chapman-Huston of Dept. of D.A.A. and C.M.G. Capt. Shelly on the 8th; Major J. E. Swinburne and Lieutenant Bascoe A.P.M. on the 9th; Major Dempster of Corps Headquarters on the 18th; Col. J. A. Roberts D.D.M.S. and Capt. Barker on the twenty-second; Lieut. Colonel Andersen on the twenty-ninth and Mrs Whitburn and Mrs Hepburne, Woman’s Legion on the thirty-first. On the ninth the Re-saw Plant was started and the results obtained have been highly satisfactory. The plant reconverts all the waste material from the main saw and edger into crating material ¾” thick: averaging in width 3″ by 1’ 10″ to 3′ 7″ in length. Since the commencement of the operation of this Plant, the daily average has been 1750 ft. B. M. in production averaging approximately 4000 pieces per ten hours. Loading facilities for this material are exceedingly handy and already considerable quantities have been dispatched on urgent orders on hand. Amongst the visitors at this Company during the month of June were: Capt. Thompson on the 6th. Capt. Begg on the 15th., Lt-Col. Penhorwood and Capt. Price, Lt-Col. Anderson and Capt. McCallum on the 17th., Capt. Shelly on the 18th., Col. White and Lt-Col. Anderson on the 19th., Lt-Col. Roebuck on the 28th. Lieut. Garden and Lieut. Selford, Y.M.C.A. on the 29th. On the 1st the Scotch Mill and Campbell Carriage was shipped to 101 Company, C.F.C. Windsor, cutting having been completed here in its position. Four pigs were sold on the 19th netting £47.18.8. Haying has been carried on during the last few days of the month, and provided the rain keeps off, we will have an excellent crop. Seven Other Ranks were posted to this Company on the 27th June. On Tuesday July 30th Musketry Training was commenced at this company by a class composed of eight men who have half a day for six days in the weak. All the men have shown their Interest by their smart appearance and attention to the instruction, and excellent progress and results are anticipated. Much interest is being manifested in the coming Company, District and Corps Sports to be held shortly, and many men outside of the baseball team and the Tug-of-war team are practicing daily the events in the above programme. With the exception of a few odd logs, sawing at the Canadian Mill has ceased, and all concentration has been diverted to Pitwood and the running of the Re-saw Plant, and in the former an average has been maintained in production of 25,000 lineal feet per day. In regard to the first Friction Clutch installed at the company for operating the feed mechanism of the carriage, it has been tested and when some minor details (which in no way affects the principle) are adjusted, the above device will prove its value to the Corps. Very satisfactory progress has been made during the past four weeks both by the crops and the livestock. The potatoes are maturing nicely with a great number to each hill; already the early variety is being dug for the various Messes, which variety is estimated to yield eight tons per acre. Other vegetables have likewise been distributed for the company’s consumption. Four hogs were sold on the 20th which netted £44.1.8, and a few days later eight little ones were added to the piggery. Capt. Jos. E. Thompson paid the company on the 6th and on the 11th Lieut-Col. Starkey A.D.M.S., Major Casgraln, Lieut-Col. Campbell and Lieut. I.R. Brigham visited the camp. 101 Comy. baseball team came for a game on the 14th but owing to rain the game had to be postponed. Captain Begg C.A.M.C. made three visits during the month, i.e. on the 2nd, 15th & 26th. Major McCuaig called on the 22nd, and on the 30th Captain C. W. Shelley brought the Rev. Dr. Wallace to speak to the men and report on life in a Canadian Forestry Corp Company. Major Moorehead D.A.A. & Q.M.G. made an inspection of the Regimental Records and the Books and of the Camp on the 29th, and on the 31st. Col. Rodd D.D.V.S. for the Eastern Command inspected all the horses of the Company, finding them in good condition. On the 2nd, Lord Templeton who had business in Woburn Sands paid an unofficial visit to the Company and was much pleased with the work of the Canadians. Lieut-Col Campbell of Corps Headquarters visited us on the 11th. and 23rd. with regard to the Canadian Mill, which officially finished Operations at 6 p.m. August 8th. The Company Sports were held on the 4th: proved a great success; the various running and jumping events had many competitors and the events, were all keenly contested; In the tug-of-war the Mill team won against the Bush, and one of the big features of the day was a baseball game with 101 Company from Virginia Water. There must have been over 1500 spectators in spite of it being Sunday, excellent Music was provided by the Newport Pagnell band; prizes were presented by Major A.R. Wilson. On August 24th. Lieut Gravenor and fifteen Other Ranks attended the District Sports at the Base Depot and our Company won the tug-of-war with ease, besides our winning several of the events. Our man are now deeply engrossed in getting into shape for the Corps Sports at which we have no doubt they will meet with equal success. After over a year in Woburn Sands the Company is about to complete its Forestry Operations; as pointed out above, the Canadian Mill stopped working on the 8th, and now all energies are directed to the work of getting out Pit Props and cleaning up the Bush; also some fifteen men are engaged in the Resaw. The advance party of forty Other Ranks left for the new site at Brockenhurst on August 28th, under the command of Lieut A.H. Gravenor and in three days they have erected their Hutments and commenced Log felling. Undoubtedly the main feature of the month has been the closing up or the camp at Woburn Sands and the commencing of operations Brockenhurst Hants, and Tisbury, Wilts. Although operations at Woburn Sands cannot at present be said to be completed, yet the middle of October will see the last of the 150,000 lineal feet of Pitwood shipped and the bush work at an end. The Re-saw plant will continue running until about Christmas. For the purpose of completing the work here, fifty Other Ranks under Capt T. A. Brewer M.M. have been left, so that a party of one Officer and 100 Other Ranks have been able to proceed to Brockenhurst and another party of three Officers and thirty Other Ranks to Tisbury. The operation at Woburn Sands is now nearly completed. Of the original Company only one Officer and six Other Ranks are left, who with the assistance of eighty seven Prisoners of War are continuing the Re-saw Plant. The Royal Engineers are taking over the camp and the remaining men of this Company will be billetted. The Camp at Woburn Sands will prove an ideal location for the purposes of the Royal Engineers. A Company of Royal Engineers have now taken over this Camp, and on November 12th, Officers and three hundred Other Ranks took possession. On November 25th, Major McCuaig and Major Wilson proceeded to Woburn Sands to meet a representative of the Timber Control to make arrangements re: the handing over of all sawn material, pit and pulp wood together with the Re-saw Plant, which is at present being operated by a small Detachment of the 125th Company, C.F.C. with the help of German Prisoners of War. This detachment with all the remaining equipment, lumber, slabbing and sawdust was finally handed over to the Timber Control on December 6th, when the remaining Other Ranks proceeded to Brockenhurst. Prisoners of War (Germans) were left behind to carry on the resaw work for the Board of Trade, under the Supervision of Mr Storey, of the Timber Control. The Diary continues for a few more pages, but there is no further mention of Woburn Sands. The Tisbury Camp was cancelled, and handed over to the Land Girls, and the men there went to rejoin the others at Brockenhurst. Sawing was undertaken, but only of saw logs, and gradually the men were sent back to their base camp, and onwards home to Canada. This ends the official War Diary of the 125th Company Canadian Forestry Corp.
Britain had requested help from the Canadians on the 15th of February, 1916, for troops to undertake lumbering operations overseas. Canada’s response was the immediate and on April 28th, 400 men, under Lt. Col. McDougall, arrived in England, and by the end of 1916, a total of 3,038 Canadians were engaged in lumber work in Britain and France. Their Base Depot was at Windsor Great Park, but more than 70 operations were tackled in Great Britain. The first lumber was produced May 13, 1916. This initial operation was made at Windsor Great Park, and the troops were frequently visited by the King and Queen. Toward the end of the operation, the Corps erected a memorial to the Corps in the form of a log cabin at the side of Windsor Castle for the King. The William the Conqueror Oak, standing beneath the King’s window, was cut by the Canadians. This tree was over 38ft in circumference, and without a saw of sufficient length, a hole had to be cut in the hollow trunk, so one man could pull the saw from inside. A. E. Grigg, in his “Town of Trains” (1980) gives the site of the Canadian Sidings as just before the halt at Aspley Guise, where an avenue of trees can be seen stretching away towards the Duke’s woods. This would seem to be the track leading to the railway from a small copse known as The Warren, which is just off Mill Lane. Transporting all the timber to this point from the woods must have been a time consuming job. An access to the track between Woburn Sands and Bow Brickhill would surely have been easier, but they must have had their reasons. The Warren is noted as being an old gravel pit, perhaps there had been rail track laid there before, to remove what was dug out. There is another source of details about the Canadians visit: the Marriage Register of St Michaels. It records the weddings of eleven local girls to men of the Canadian Camp, the earliest being December 12th 1917, and the latest on 8th January 1919, when the soldier came back from the Tisbury camp for his girl. With all the young men folk away at war, the arrival of a detachment of Canadian lumberjacks must have caused quite a stir, pre-dating the WW2 ‘invasion’ of American GI’s. In June 1917, Mr W Kent, the Wolverton Methodist Circuit Quarterly Meeting Secretary, who lived in Woburn Sands, tendered his resignation from his office, as he had been found guilty at the Woburn Magistrates Court of taking bread to the German prisoners of war. However, the meeting judged that he had not broken any ‘divine law’, and was guilty, in their eyes, of only an indescretion, so they voted unanimously to refuse to accept his letter. If you look very closely at the top left hand side of the postcard, you can see some faces of men inside the hut behind the arranged group. They obviously decided not to be left out of the photograph! The Ampthill and District Archeological and Local History Society have republished a period book about the 126th Co., who were stationed at Ampthill, and it tells a very similar story to that of the 125th Co. at Woburn Sands. It shows the laying of railways, the men at work in timber production, and the facilities provided by the YMCA to the men. This postcard, dated 3rd May 1918, was found locally in some family archives. Legend within the family says he was a Greek sweetheart of their Aunt, but her father was against the relationship. As his name and service number are written on the rear of the card, we were able to find his Army papers in the Canadian Archives, which shows he was originally a Russian, and had served 3 years with the Russian Army. 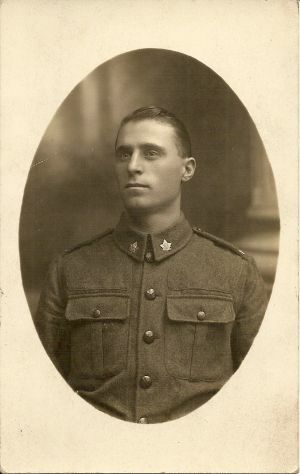 Private Ivan ‘John’ Morar, of the 125th Canadian Forestry Corp. Very little else exists in print about the Canadians visit to our district. If you are able to contribute any further details, please get in touch.